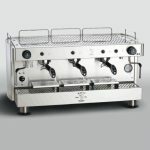 This model can be installed anywhere without connections to the main water supply net; thanks to the boiler system with heat exchanger and to the practical group heating system cappuccinos, coffee and tea can be produced for small communities. The new hydraulic and electric system allows reaching a thermal stability and an accurate setting of the temperature equal to machines in the professional segment. With a volumetric dosage for coffee brewing controlled by a microprocessor. 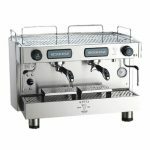 The 2 doses setting is done by the push-buttons and third push button for manual continuous coffee brewing. The PID temperature control system replaces traditional pressure switch and shows the boiler temperature on a display; the temperature can be adjusted by the user in a range from 80C° to 100C°.